Frazer can track your Form 8300 reporting requirements on each individual sale. The IRS Form 8300 will prompt to print after a cash (or cash equivalent) transaction of more than $10,000 is saved into the program, either through a one-time transaction or total over a period of 12 months. Click on . Provide the requested information on the subsequent screen. Click . The Form 8300 Instructions, a letter informing the customer that their information has been reported to the IRS, and the Form 8300 will print. Clicking will save the entered data, but nothing will print. To print the Form 8300 at a later time, go to and select the customer. In the customer's account, click on then go to . Then click on the Miscellaneous tab and choose . 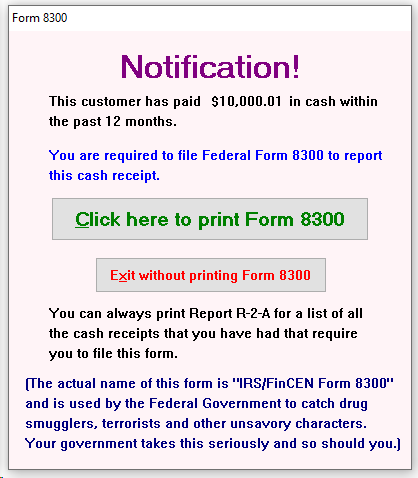 If over $10,000 in cash (or cash equivalent) was NOT recorded within a 12-month period, the screen below will appear. From here, if you still want to print the Form 8300 for your customer, click . 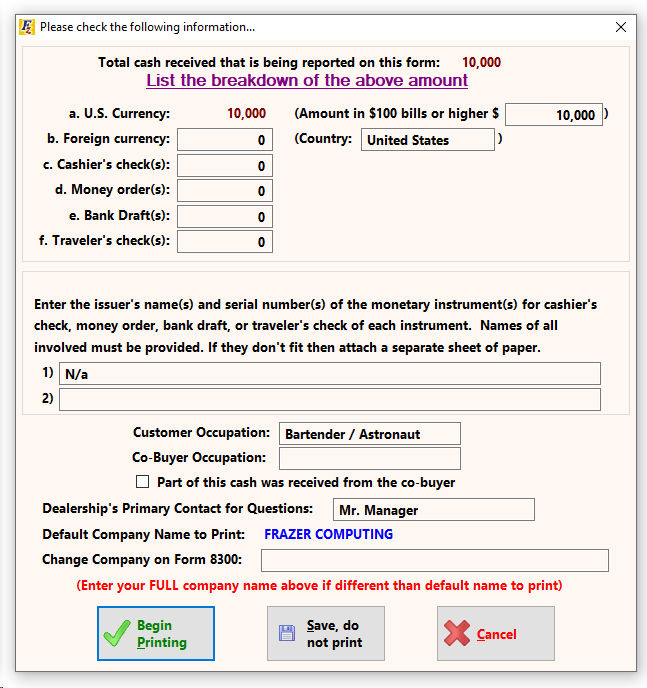 This allows you to load and print a Form 8300 out of Frazer, even if the software didn't prompt you to print it. Alternately, you can click to have Frazer open up a PDF of a blank 8300 you can view whenever you'd like. 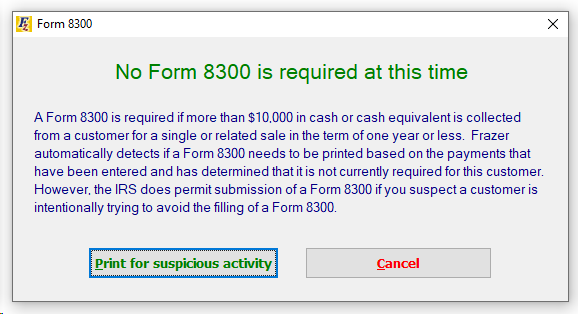 All instructions regarding Form 8300 are available by clicking on in the program (IRS Form 8300 Instructions).